KFC has closed more than half of its 900 UK outlets after delivery problems meant they ran out of chicken. Last week, the fried chicken chain switched its delivery contract to DHL, which blamed “operational issues” for the supply disruption. It was unclear when the delivery problems would be rectified, a KFC spokesperson said. KFC has set up a web page where “fans” can find their nearest outlet that is still open. It said that in the restaurants owned by the chain, staff on short-term contracts would be paid the average hours worked per day over the past 12 weeks, while those on salaries would be paid as normal. However, 80% of KFC outlets are run on a franchise basis. “Franchisees will be seeking their own independent advice, but we’re encouraging them to adopt this policy too,” said the chain. Until last Tuesday, KFC’s chicken was delivered by South African-owned distribution group Bidvest, which describes itself as “the leading supplier of logistical and supply chain solutions to the UK hospitality and restaurant sector”. But after the change in the contract, many of the food giant’s outlets began running out of chicken products. “The chicken crossed the road, just not to our restaurants,” KFC said on Twitter. “We’ve brought a new delivery partner onboard, but they’ve had a couple of teething problems – getting fresh chicken out to 900 restaurants across the country is pretty complex!” it added, apologising to customers for the inconvenience. The statement listed KFC restaurants that were still open despite the problems. He said: “Bidvest are specialists – a food distribution firm with years of experience. DHL are scratching around for any work they can get, and undercut them. One KFC customer, Claire, told BBC Radio 5 live she was surprised when she went out with her children at the weekend. 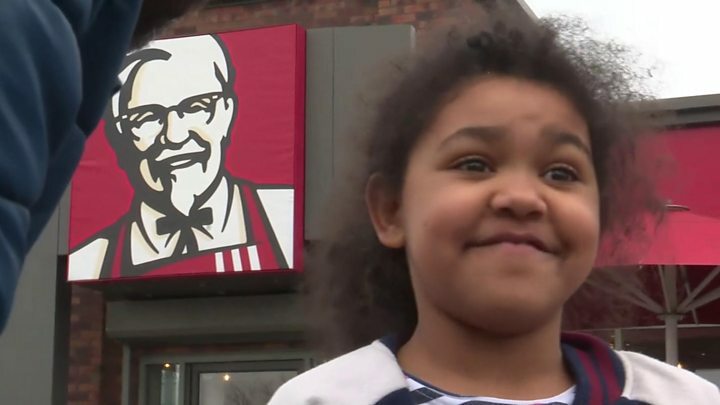 “We went on Saturday night to our local KFC in Luton and queued for about 20 minutes in the drive-thru, about 15 cars in the queue, and when we got to the actual counter and asked for our standard family bucket, we were told there was no chicken,” she said. Other disgruntled KFC customers have been taking to Twitter to express their dismay at the shortages.